Do you remember Wallace and Gromit? Or perhaps seen Gumby? 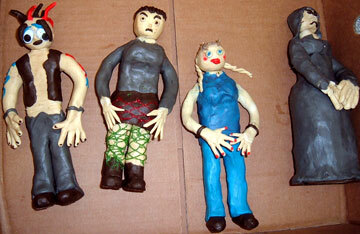 There are many different claymation artists, styles, and characters out there. Some you may remember, and some you might not have know that it was clay. Yet there are still some very nice, well-known claymators out there. And most of them have quite the history in claymation. Claymation and its wonderful history dates back to about 1897, with the introduction of a messy material artists called plasticine. In more recent times, a modern man named Art Clokey started producing claymation advertising films in the 1950's, and then went on to make the famous Gumby and Pokey television show, which brought claymation into the households of many children and other household viewers. The Gumby and Pokey series ran from 1956 until about 1963, and Gumby made a come-back around the 1980's. 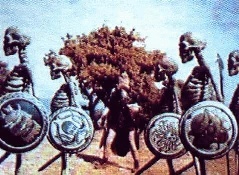 One famous claymation sequence that also showed great potential and claymation skill is the skeleton scene in the 1963 Jason and the Argonauts. Another is the 1985 animated production of The Adventures of Mark Twain and the 1988 Meet the Raisins by Will Vinton. In 1989 Nick Park created the wonderful Wallace and Gromit animated series and later went on to produce a number of other films starring Wallace and Gromit before Aardman Animations worked on the famous Chevron Cars commercials starting in 1995. While conventional commercials are shot on 35 mm film at 25 frames-per-second, the claymation production requires stop-action photography, shooting up to 30 individual frames for each second of film.